After one of the quietest periods of solar activity in known history, the Sun has roared into a new sunspot maximum cycle. With the increase in sunspot activity is the increased risk of solar flare activity that could impact human-created systems both in orbit and on the ground. This occurs almost exactly 150 years after the biggest known solar flares that disrupted telegraph communications and created unprecedented auroras around the world. In April 2009, solar physicist Dean Pesnell stated, “We’re experiencing a very deep solar minimum,” based on the number of days without recordable sunspots in 2008 and 2009. That statement was before a late summer episode of 51 days in a row of no sunspot activity that ended on August 31, one day short of tying the record of 52 days. 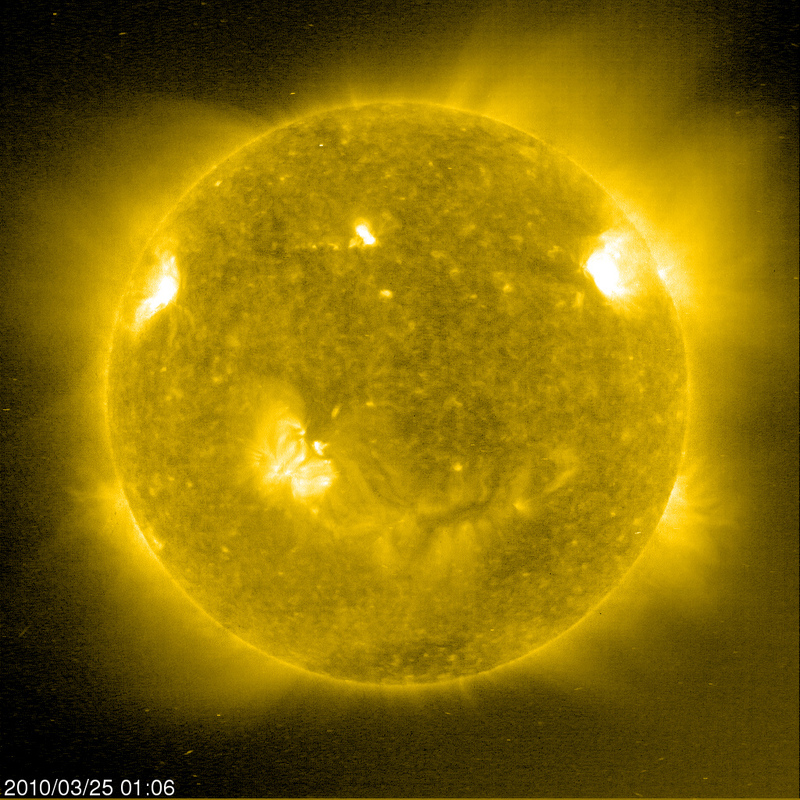 The April 1, 2009, National Aeronautics and Space Administration (NASA) news release also stated that the solar wind pressure was at a 50-year low and the Sun’s extreme ultraviolet radiation was 6% less than the last solar minimum in 1996. On September 3rd, NASA issued a news release titled, “Are Sunspots Disappearing?” Solar Researcher Matt Penn states in the release, “Sunspot magnetic fields are dropping by about 50 gauss per year. If we extrapolate this trend into the future, sunspots could completely vanish around the year 2015.” However, even Penn admits that they have little historic data to conclude that this is a permanent trend. However, by late in September the Sun started showing signs of new sunspot activity. The upturn in activity this year is dramatic. In 2009, 29% of the days had a visible sunspot. So far this year 93% of the days have had sunspot activity. The expected peak of the current activity will be in 2012-14. 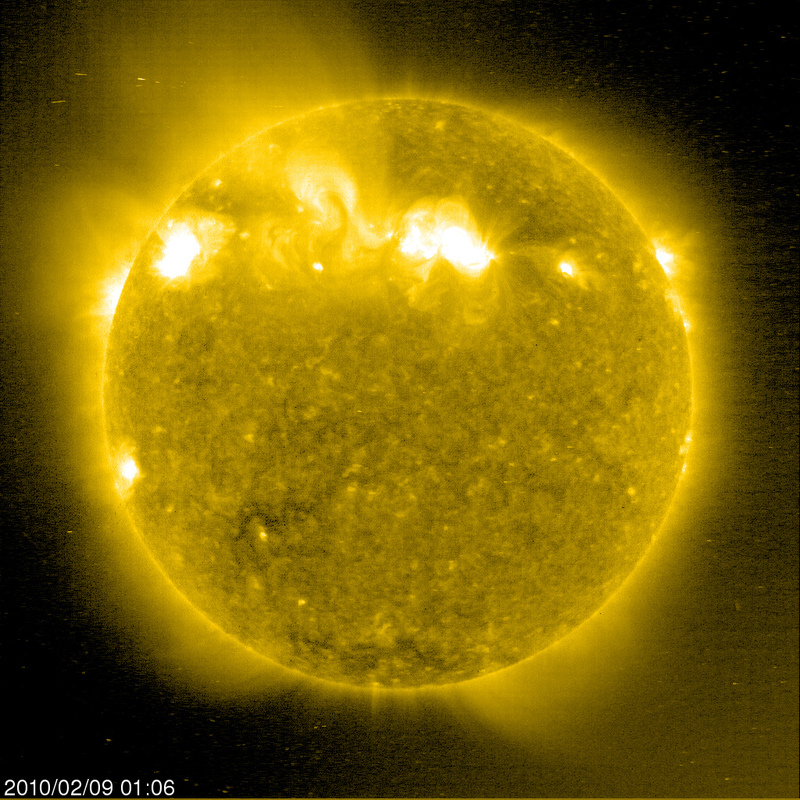 No one knows if the unusually quiet Sun of 2008-09 will mean be a quieter, gentler solar maximum, or whether the Sun will bounce back with a significantly more active period, but a scientific panel for National Oceanographic and Atmospheric Administration’s (NOAA) Space Weather Prediction Center (SWPC) is betting on a quieter solar maximum than the last one in 2000-01 (see Table A) and no one believes we will have a solar cycle that will match the activity of 1859. On August 28, 1859 and again on September 2, 1859, solar flares created so much electromagnetic energy on Earth that telegraph communications were temporarily disrupted. At one point operators in the northeast were only able to communicate by detaching the power source to the telegraph lines relying on the solar flare energy captured by the wires between stations. From 8:30 to 11:00 AM on September 2, 1859, telegraph operators between Boston, MA and Portland, ME discovered that by detaching the batteries that powered the telegraph lines they could send messages using the electromagnetic energy caused by a solar flare. In addition to rendering most lines nearly useless the solar event created sparks from telegraph lines and telegraph equipment causing fires in multiple locations. However, it has been determined that the magnitude of the August/September 1859 solar events are rare in human experience. Through ice core samples going back 500 years scientists have determined that the 1859 solar flares were 6.5 times more powerful than any other flare event in known history. In 1859 there were relatively few technological devices that would be affected by the electromagnetic energy from the Sun and had the event occurred 15 years earlier it is likely that the only note of it in history would be the unusually bright auroras. Today the threat is much greater as power grids, pipelines, and copper phone and data lines would all act as a conduit for the energy of a major solar flare event. Among the greatest concern is the loss of many, if not all, satellites in a major solar event. To respond to these concerns a new field of Space Weather has emerged to monitor and respond to any potential, although unlikely, massive solar flare. There are three satellites watching the Sun 24/7/365. The first, called the Solar & Heliospheric Observatory or SOHO, maintains an orbit around the Sun that is directly between the Sun and Earth. Two other satellites, the Solar TErrestrial RElations Observatory or STEREO satellites, are in the same orbit as Earth is around the Sun, but STEREO Behind trails about 45 degrees behind Earth and STEREO Ahead is 45 degrees ahead of Earth (See Figure A). These three satellites give scientist a view of almost the entire surface of the sun. Any flare threatening Earth would be identified and evaluated at least 15 hours prior to affecting the planet. Most flares take 60 or more hours to reach Earth, but the flare of September 1-2, 1859 took an unusually rapid 17 hours from ejection from the Sun to interaction with the Earth. To prepare for these solar related incidents private industry and government agencies have spent years creating a response plan that will minimize the effect of a major solar event on the nation’s vital systems. Access to the Space Weather reports are also available to the general public at through both NASA and NOAA. No one disputes that the next few years should see an increase in solar activity. Nor does anyone dispute that humans are more vulnerable to a major solar event. However, as the Sun shakes off the quiet of the past few years it is likely we will experience a quieter solar maximum than 2000-01, and no one predicts a repeat of the solar storms of 1859 anytime soon. Good coverage, thanks. 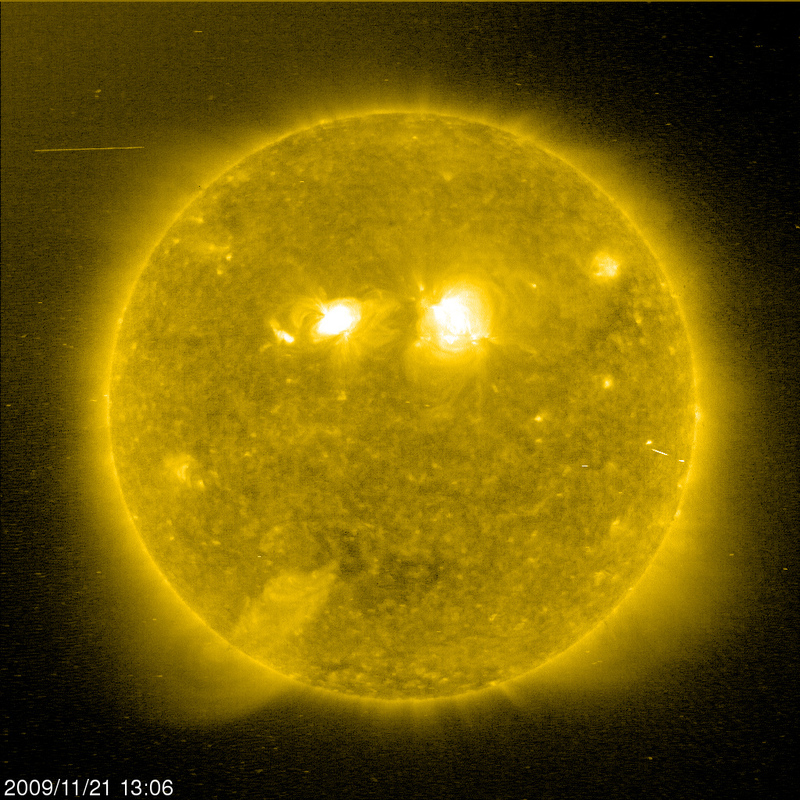 Now look at the last photo,March 24 Sun…and see a SMILEY FACE! Thanks! I’ll take a look. I have one image saved from about a month ago that looks like a face coming out of an active region. For clarification, this article is not about a coming ‘end to the world’. I know that a Armageddon website linked this article; however, was not at my request. Sunspot activity rolls on a eleven year cycle (or approximately.) There may be off and on significant activity through 2014 and activity in 2012 may be impressive, but as I say in the article there is no reason to believe that this activity will approach the flares of the 1800’s. As for the weather in Australia, it could be a cycle, but it is more likely do to the retention of solar energy caused by too much carbon dioxide in the air.